Wisconsin Republicans have begun increasing the pressure on the Democratic State Senators who fled Wisconsin to prevent legislature from having a quorum, thus forestalling that body’s ability to vote on budget legislation aimed at returning the state to a sustainable course of fiscal sanity. These Democrats, who fled Wisconsin faster than the French left Paris, are obstructionists who are refusing to work within the law, continue to reject the defeat Democrats suffered at the polls in the November midterm elections. The massacre suffered by the Democrats in November was due to a political tsunami of American voters who turned out by the millions, casting their votes for fiscal responsibility. Governor Scott Walker said the 14 minority Democrats who left Madison on Thursday were failing to do their jobs by “hiding out” in another state and Senate Majority Leader Scott Fitzgerald said his chamber would convene Tuesday to act on non-spending bills and confirm some of the governor’s appointees – even if the Democrats don’t show up. That these Senate Democrats – what few remain – are hiding out, rather than doing the job that the voters elected them to do should outrage their constituents. Senate Democrats acknowledged that the 19 Republicans could pass any item that doesn’t spend state money in their absence. The budget-repair bill they have been blocking requires a quorum of 20 senators to pass, while other measures require only a simple majority of the chamber’s 33 members. Nonetheless, Democrats said they were standing firm in their opposition to the budget-repair bill, which would take away the right of most public employees to collectively bargain for their benefits and working conditions. 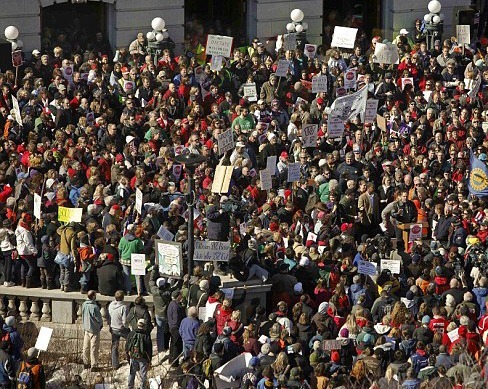 Hundreds of protesters filled the Capitol for a sixth straight day, noisily calling on Walker to drop the plan they consider an assault on workers’ rights. It always amazes me that unions attempt to characterize their argument over working conditions as if school teachers, airline pilots and the like would be subject to the most heinous working conditions, were it not for the unions, as if they are in the same position as oppressed coal miners of 100 years ago. It is simply not the case. Walker has been targeted by protesters for nearly a week for negotiating a bill now in the state Senate that would require workers to increase their contributions to pensions and health care coverage, would limit collective bargaining rules and tie raises to inflation. Senate Democrats fled Wisconsin to avoid voting on the legislation. The state’s nearly 300,000 public sector employees are being asked to give up benefits worth about $300 million over two years, or less than 10 percent of the deficit total. When union members are being asked to contribute only nine percent of the amount it will take to fix the budget problem, it is hardly a case of union busting, as has been charged. Protesters and Democratic lawmakers have likened Walker to a dictator, and demonstrators protesting the budget bill have waived signs comparing him to ousted Egyptian leader Hosni Mubarak and Adolf Hitler. Protesters are pledging to remain in the Wisconsin Capitol while Senate Democrats are committed to staying out of state. Governor Scott Walker is no Adolf Hitler. He is courageously trying to balance the state’s budget and return Wisconsin to fiscal responsibility. He should stay the course and not give in to the Unions. He should fire people as will become necessary, as will become necessary all across the country, if sanity is not restored to the budget process. He should begin be firing the school teachers who called-in sick, depriving our children of an education. Governor Walker should also remember how Ronald Reagan’s popularity soared after he fired the striking air traffic controllers in 1981.